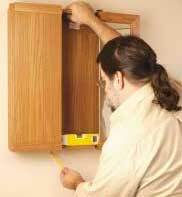 Most medicine cabinets are mounted on the wall surface or in a recess. 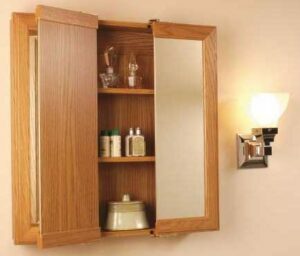 Installing a surface-mount medicine cabinet is about as simple as hanging a picture. Installing a surface-mounted medicine cabinet is a relatively easy DIY project. Even if your existing cabinet is mounted in a recess, you can upgrade to a larger surface-mounted type. 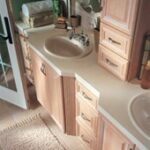 Medicine cabinets come with sliding, hinged, or pivoting doors, in one, two, or three sections, and a vast number of materials and styles to match almost any decor. 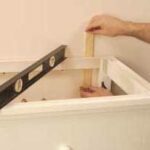 You can also update an outmoded built-in medicine cabinet by simply removing it from the wall, packing the empty cavity with insulation, and covering the hole with a larger surface-mounted medicine cabinet. Level the cabinet where you want it and lightly mark a line underneath it. 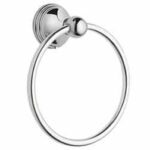 The most important thing to keep in mind when installing a surface-mount medicine cabinet is that it can become quite heavy when full so it must be attached securely to the wall studs. 1Hold the medicine cabinet in place, level and centered over the sink, and trace along its bottom edge lightly with a pencil. If necessary, have someone help you with this step. 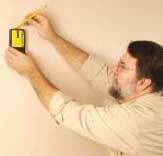 Use an electronic stud finder to locate wall studs. 2Using a stud finder, locate and then mark the positions of the studs within the marked area, and transfer these to the inside of the cabinet. Fasten through a structural part of the cabinet back to the wall studs. 3Drill four 1/8-inch-diameter holes through the back panel of the cabinet at the marked locations. Most cabinets have a cleat or hanging rail at the top of the back to help support the cabinet’s weight; make sure the top two holes are drilled through this cleat. 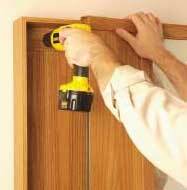 Secure the cabinet to the wall studs with the screws provided. If you can’t hit the wall studs at each location, use hollow wall fasteners.